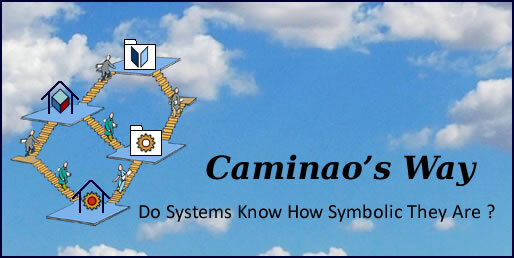 Caminao's Ways – Do systems know how symbolic they are ? The immersion of enterprises into digital environments and the merging of business and engineering processes are bound to impact traditional approaches to strategic planning. A detour into virtual and augmented reality may help to understand how the digital transformation is to affect the ways actual and future circumstances can be assessed and acted upon. External horizons are set on markets, competition, and technologies, with views and anticipations coming through data analytics and game theory. Internal horizons are set on enterprise architectures, with business models and policies on one hand, organization and systems on the other. Both are set on purposes, the former aiming at specificity and edge, the latter at sharing and stability. (external horizons) are concerned, time is of the essence; that’s where is the fault line: whatever enterprise planned time-frames, they can only be mapped to fuzzy or unreliable ones outside. As a corollary, alignments have to be carried out either as a continuum, or through discrete and periodic adjustments to predictive models. 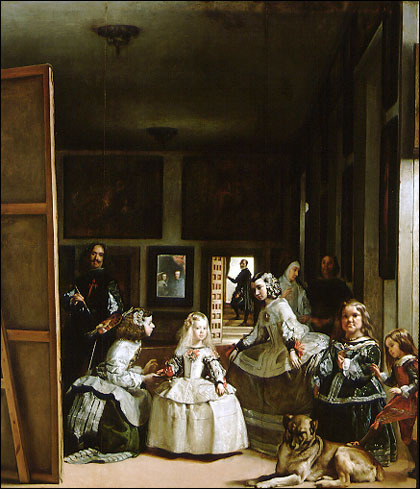 Strategies set along predefined time-frames are by construct loosely tied to business environments since discrepancies are bound to develop during the intervals between anticipations (virtual reality) and realizations (actual reality). Hence the need of overall and planned adjustments. 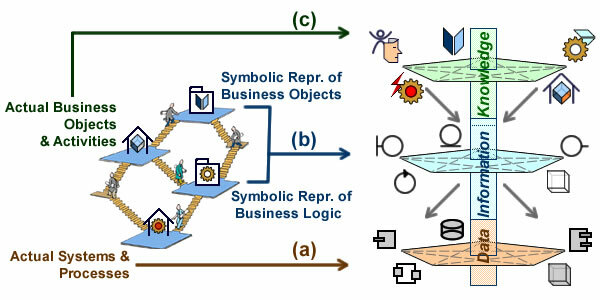 By contrast, strategies set dynamically through OODA (observations, orientation, decision, action) loops can be carried out without overall anticipations; like augmented reality (AR) they mix fine-grained data observations and business intelligence with additional layers of information deemed to be relevant. The first category has for long been a cornerstone of established strategic planning, with its implicit assumption of a conceptual gap between ‘Here and Now’ and future visions. But the induced latencies and discrepancies may become liabilities if enterprises have to continuously adjust representations and policies. As self-conscious organisms immersed into competitive environments enterprises survival depends on their awareness of changes. For mammals such awareness is a biological capability: any discrepancy between perceived movements and their counterpart in the vestibular system is to generate motion sickness or vertigo. Enterprises have no such built-in mechanism yet their awareness is nonetheless contingent on the alignment of representations with observations and orientations. As a corollary, out-of-kilter time-frames and outdated schemes may remain unnoticed, introducing governance dizziness and strategic missteps. Operational decisions, to be carried out within processes time-frame (a). Architecture decisions, for changes in assets affecting the design of business processes and supporting platforms (b). Organizational decisions, for changes affecting roles and processes (c). Weaving fine-grained threads across enterprise architectures and consistent time-frames. That would allow the weaving of fine-grained policies across enterprise architectures and along consistent time-frames, mixing actual observations, representations of current and planned assets and resources, and anticipations of markets changes a competitors moves. External horizons: business decisions could be balanced by the need to know with the reliability of available information. Internal horizons: decisions about organization and systems could be taken at the “last responsible moment”, i.e until not taking side could change the possible options. Strategic planning could then be defined by crossing these rationales at the relevant granularity. As demonstrated by a simple Google search, the MBSE acronym seems to be widely and consistently understood. Yet, the consensus about ‘M’ standing for models comes with different meanings for ‘S’ standing either for software or different kinds of systems. In practice, the scope of model-based engineering has been mostly limited to design-to-code (‘S’ for software) and manufacturing (‘S’ for physical systems); leaving the engineering of symbolic systems like organizations largely overlooked. As far as practicalities are considered, the latter is the usual understanding, specifically for the use of design models to generate code, either for software applications, or as part of devices combining software and hardware. It puts the focus on domain specific implementations, ignoring the benefits for enterprise architecture. It perpetuates procedural processes built from predefined activities instead of declarative ones governed by the status of artefacts. It gives up on the conceptual debt between models of business and organization on one side, models of systems on the other side. These stand in the path of the necessary integration of enterprises architectures immersed into digital environments. As social entities enterprises are set in symbolic realms: organizational, legal, and monetary. Now, due the digital transformation, even their operations are taking a symbolic turn. So, assuming models could be reinstated as abstractions at enterprise level, MBSE would become the option of choice, providing a holistic view across organizations and systems (conceptual and logical models) while encapsulating projects and applications (design models). MBSE provides a holistic view of organisations and systems. That distinction between symbolic and actual alignments, the former with conceptual and logical models set between organization and systems, the latter with design models set between projects and applications, is the cornerstone of enterprise architecture. Hence the benefits of implementing it through model based system engineering. While MBSE frameworks supporting the final cycle of engineering (from design downstream) come with a proven track record, there is nothing equivalent upstream linking business and organization to systems, except for engineering silos using domain specific languages. Redefined in terms of enterprise architecture abstractions, MBSE could bring leveraged benefits all along the development process independently of activity, skills, organization or methods, for enterprises as well as services and solutions providers. As a modeling framework, it would enhance the traceability and transparency for products (quality) as well as processes (delays and budgets) along and across supply chains. Implemented as a service, MBSE could compound the benefits of cloud-based environments (accessibility, convenience, security, etc. ), and could also be customized without undermining interoperability. Customers (projects): services should address cross-organizational and architecture concerns, from business intelligence to code optimization, and from portfolio management to components release. Policy (processes): services should support full neutrality with regard to organizations and methods, which implies that tasks and work units should be defined only with regard to the status of artifacts. Platforms: a set of basic constructs focused on systems and software design, and supporting direct mapping to programming languages. Systems: semantics focused onwell accepted functional and logical specifications supporting truth-preserving extensions. Organization: additional semantics for the mapping of generic systems functionalities and specific enterprises roles and responsibilities. Business: knowledge architecture bringing together enterprise semantics and domain specific extensions. Work units are to be defined bottom-up from artefacts. Transparency and Traceability: Two distinct model sets – Architecture Models and Implementation Models. Endpoints (collaboration): if services are to be neutral with regard to the way they are provided, the collaboration between the wide range of is to be managed accordingly; that can only be achieved through a collaboration framework built on layered and profiled ontologies. As a concluding remark, cross-breeding MBSE with Software as a Service (SaaS) could help to integrate systems and knowledge architectures, paving the way to a comprehensive deployment of machine learning technologies. As every artifact, models can be defined by nature and function. With regard to nature, models are symbolic representations, descriptive (categories of actual instances) or prescriptive (blueprints of artifacts). With regard to function, models can be likened to currency, as they serve as means of exchange, instruments of measure, or repository. No use of models, direct exchange (barter) can be achieved between business analysts and software engineers. Models are needed as medium supporting exchange between organizational units with different business or technical concerns. Models are kept and maintained for subsequent use or reuse. Depending on organizations, providers and customers could then be identified, as well as modeling languages.